Some homeowners who sustain damage from Sandy will have to pay thousands of dollars upfront for a hurricane deductible before insurance payments kick in. Thanks to a little-known hurricane deductible, homeowners with property damage from Hurricane Sandy could be on the hook for thousands of dollars before their insurance payments kick in. Increasingly, insurers in hurricane-prone states -- including almost all of those in states affected by Sandy -- have been adding hurricane deductibles to their homeowner's insurance policies that go into effect when named storms have sustained winds of 74 miles per hour or more, as measured by the National Weather Service. Unlike regular deductibles that require you to pay a set dollar amount, typically $500 or $1,000, hurricane deductibles often require homeowners to cough up 1% to 5% of their property's value. In places like Florida, the deductible can run as high as 10%. That can result in thousands of dollars in out-of-pocket costs. A loss on a $200,000 house covered by a policy that carries a 5% deductible could cost the homeowner $10,000 before the insurer pays any part of the tab. As a result, many claims result in no insurance payoff at all. The ins and outs of hurricane deductibles vary by state, insurer and by individual policy. In New York State, for example, the Department of Financial Services site lists various insurers' hurricane deductibles and each one varies dramatically. Allstate's 5% hurricane deductible only kicks in when wind speeds exceed 100 miles per hour. Meanwhile, State Farm's deductibles are 2% or 5% and can apply to storms with lower wind speeds of 74 miles per hour. ACA Insurance has a 1% deductible for Category 2 (96 to 100 mile per hour winds) or higher hurricanes and a fixed deductible for Category 1. Generally, the more at-risk the home is -- the closer it is to the shoreline, for example -- the more likely it is to have a stiff hurricane deductible. And the coverage only affects damage caused by high winds. Private homeowners insurance almost never covers flood damage. Consumers should examine their policies to see how their deductible impacts their coverage. Insurers along the Eastern seaboard and in the Gulf started putting these deductibles in place after Hurricane Andrew in 1992, which caused $15.5 billion in damages, according to the Insurance Information Institute. The insurers claimed hurricane-related losses were so high that they had to add the deductible in order to keep property insurance available and affordable. 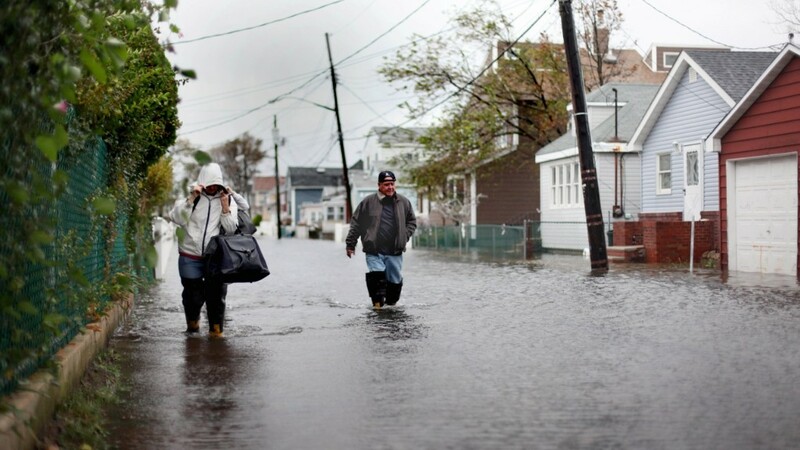 Hurricane Sandy is expected to cause as much as $10 billion in damages, according to Eqecat, a disaster modeling firm.